Lines in print. Stepper resolution problem? Re: Lines in print. Stepper resolution problem? The basic flaw of the whole flexible coupling is that the coupling has to do two things. It has to transfer torque and it has to align the spindle. Transferring torque is its main purpose. Aligning the spindle isn't. How can a flexible coupling align anything? This doesn't work! I think this is a design flaw. So I came up with the this idea. What if I make a very accurate hole in the spindle. It only has to be 1mm deep. With this modification the alignment of the spindle has been taken care of. 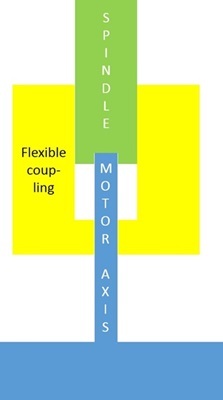 The function of the flexible coupling is now reduced to only transferring torque. Even if the coupling isn't perfectly aligned itself it doesn't matter. The coupling can never overcome the alignment of the connection I created. This should work. I´m using the cheap solid couplers on the diy right now giving the results in the picture. The leadscrews are never fully straight so the flexible coupler compensates for that usally. The elastomer couplings would be a good next step as they are quiete stiff and are used on CNC machines, so they are designed for higher torques and you can exchange the elastomere for different applications. Flex vs torque. They have a circular deepening inside so that the stpper shaft and leadscrew is properly aligned. I got one on my mpcnc and it is working pretty good. I suppose the best option for printers are the stepper motors with integrated leadscrews as a lot of the coupling issues are sorted out that way. They are quiete expensive and when they are slightly bent they definetely will influence the bed stronger than the flexibles. I think the prusa design is a little better regarding the part tolerances but it also introduces some other problems like the relatively heavy bed moving around. Your coupling approach looks good if you can machine it precise enough. I think that the flexibility is a good thing in one direction and reducing your leadscrew diameter might help as well. As you have only one lead screw why not try a ball screw? Is there a shop that rents mechanical parts for a weekend? Interesting suggestion However I would like want to try my proposal first. Definetly worth a try. I´m curious if that helps. Sadly enough it didn't. Not because it was a bad idea but because of bad tooling. I used a really old lathe at my work. It turns out the lathe is bend I did notice this but I tried it anyway. Now the spindle is wobbling more than it ever did. I will remove the hole and go back to the way it was. I don't have another lathe at my disposal. Bent lathe or not, creating rigidity between the motor shaft and the leadscrew will predictably lead to more wobbling, it's the whole reason we use flexible couplers in the first place. Unless you can ensure that your leadscrew is perfectly straight and every component with which it interacts is perfectly lined up (which has probably never happened on a 3d printer), trying to center your shaft and screw will amplify every imperfection the screw encounters. Anyway, it´s always a good thing to try new paths. If the lead screw is captured at the the top, than I suppose you get shifting movements in X/Y and tilting at the coupler. If it´s loose you get mostly a tilting movement with a slightly bend leadscrew. My apologies for the long silence. I have been busy with many things. First of al, let me correct something. This is not true. I will explain you why. Here is a picture of the normal situation. The problem is friction. Lets assume my print bed ways 3kg and the coefficient of friction between the motor axle and spindle is 0.2. The force necessary to move the spindle on the motor axis in this situation will be 0.6kg! This force will eventually be generated by the print bed when the print bed comes really close to the coupler. This will create one heck of a lot Z wobble issues! Remember that my flexible coupling actually creates a miss alignment itself by means of bad tolerances on the holes. This problem can been solved by removing the misalignment of the spindle by means the solution mentioned above. Can this solution create alignment issues? Yes it could. But it will be less due to the better alignment. You definitely don't want the XY force of 0.6kg! By now you can probably guess what I have been up to all this time. I found another lathe and I successfully implemented my idea. Did it work? Yes and no. I'm still confident that this solution works but it is not visible on the print. The quality is still unchanged. Probably mainly because I'm printing small objects which are far away from the coupler. The influence of the coupler modification will be minimal on those objects. I have been busy printing several test prints to figure out what the reason for those line are. This is what I tested. No matter what I try the lines remain there. I'm running out of ideas. Could coupling stiffness be an issue? I will investigate this Any other ideas? I ran a simulation on the stiffness of the flexible coupling. I wanted to know how much rotational flex there is when for some reason the torque to rotate the spindle varies. Sadly enough I don't know how much the torque varies. So I used the holding torque value of the motor. This is a ridiculous worst case scenario because the torque will never fluctuate by this amount. The flex coupling deforms 3.2 degrees with a torque of 0.44Nm applied to it. This translates to 0.026mm Z axis movement. I was printing at 0.15mm. I find it hard to believe the flexible coupling is the problem. The calculation shows that you only have a few microns of Z axis movement with some torque variation on the spindle. This is not that much. Nevertheless I did print one print with a slightly stiffer coupling (almost the same). Again the results show no improvement. Hmm, I don´t have direct suggestions but I tried some things on my build as well. I use energy chain parts as printtest at the moment so the chain gets longer and longer showing the improvements and it seems gone at the moment. I have to retest this with the same part in the picture comparison. Just some thoughts that maybe helped me.